Jumping into the fray I’ll say Kazhir Khan’s speech at the 2016 Democratic National Convention was a beautiful lesson in ethics, civics, loss, honor and sacrifice. A speech of power and raw emotion. I cried during it and I don’t remember crying in a long time over a speech. Shortly after he finished, the shameless Ann Coulter had the following to say and in a few words made clear that the divide in the USA isn’t just about politics. I know race-baiters roam freely everywhere but how does this woman have a following in the U.S.A.? A national commentator. Can simple troll-ism generate such popularity? Are we still such a hive of racism? Have we so much further to go? Donald Trump fueled the fire by suggesting Khan’s wife stood silently next to her husband during the presentation because of Muslim strictures on women being silent before men, yet later she explained that she stood silent because of grief, discomposure and being unused to standing before a large audience. Is it America that fuels the Ann Coulters and Donald Trumps or is it the other way around? Or is it symbiotic? Whatever gives their ideas ground to flourish is disheartening and a diminishment of us. Sure, many people quickly voiced the opinion that they would rather live in Mr. Kahn’s America rather than Trump’s (or Coulter’s) but the reality remains that retrograde ideas remain vibrant and alive and that people like Coulter and Trump continue enjoying a large measure of popularity. For now we’re a far ways off from Mr. King’s sentiments. And Coulter and Trump would happily take us backwards. But here’s hoping that MLK will have the final word. 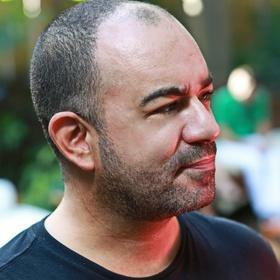 Carl Kruse is based in Miami, Florida. 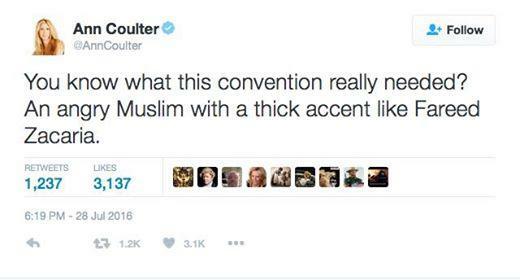 Coulter is as pathetic as Trump, even more so. She should know better, but doesn’t. She is race-obsessed and extremely xenophobic.